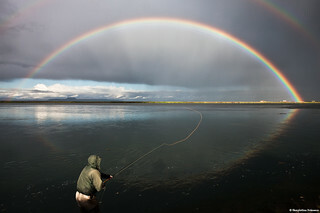 I wonder if the dream fish is hiding under the Rainbow? A shot from a salmon fishing trip to West Rangá and Hólsá, Iceland in july 2010. I've not often observed such a perfect rainbow before, and quite lucky to have the camera in the right place.